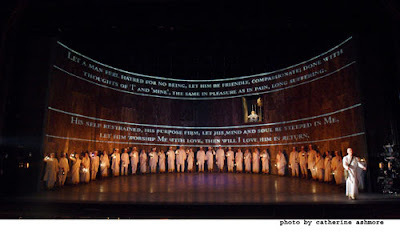 This is the most beautiful staging I have ever seen in opera. 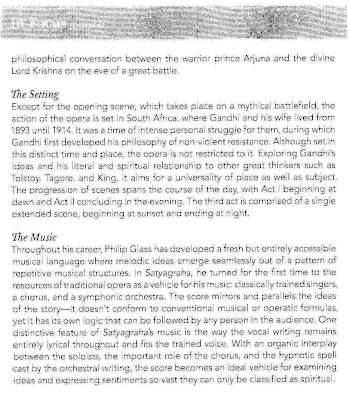 An artistic journey through slow-motion perfectly complimented by the music of Philip Glass. 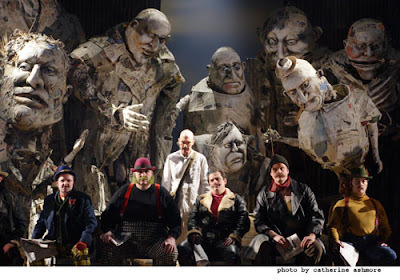 The work of English director Phelim McDermott and his company Improbable brought magic to the stage of the Metropolitan Opera, making it indispensable to pass on a perfect spring saturday afternoon in New York. 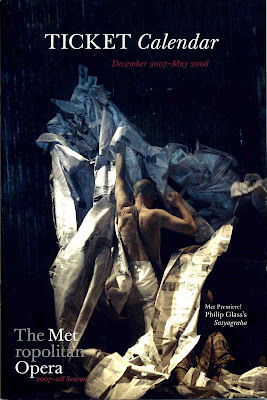 This production is enlightened by very aesthetic effects that are accessible, meaningful and poetry, really. The beauty of the visual is what kept me very much in this 3 hours and a half of Glass' music. Not that I don't appreciate his music because I do, a lot, but three hours and a half is really a long time to focus on it. The mind-wandering experience gets annoying after a while (one hour is my usual limit). Yet I couldn't leave early because of this extraordinary staging. Trying to describe the set and the lightning accurately is no easy task, but these pictures give a good overview and will definitely help me remember this afternoon at the opera. The cohesion between the music and the staging is exceptional; the slow-motion in particular is a perfect fit for Glass' minimalism. The puppets everybody talked about can seem a bit over the top but in context, they offer an interesting display of the old battle of David vs. Goliath (especially in the first scene where the English monarchy, portrayed by a praying mantis is fighting against the Indian soldier in armor). 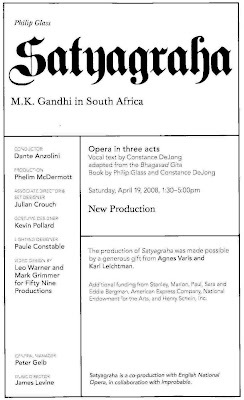 The journey ends visually as it started, Gandhi being buried under newspapers, in the same way Glass' music is always going in circles, which was, once again, a very relevant and thoughtful touch. 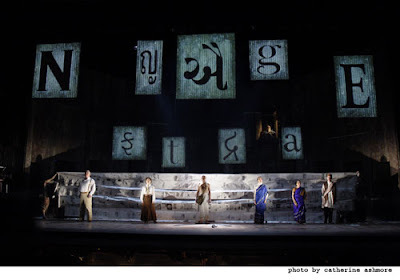 various supports are used to project words (English or Sanskrit) in the first scene (newspapers hold vertically by the actors) and then again in Act II (parts of the corrugated-iron walls). The result is probably intended to be powerful and politically inclined (as this whole piece is), it was really just a nice visual effect in my dreamy journey. 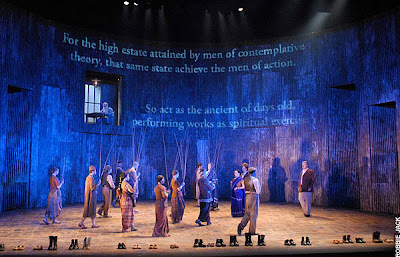 the Tolstoy scene (scene 2 of Act I) ends with bar branches planted in the floor, dividing the space to show the different routes each character is going through. The tiny cottages brought on stage afterwards bring absolutely nothing to the atmosphere, but the windows opening high in the set walls provided very pictorial yet very meaningful frozen scenes. the alligator made of weaving baskets in the beginning of The Vow (scene 3 of Act I) did not do it for me; later in that scene, the hangers that descended from the ceiling and where everybody on stage hung his or her jacket were really successful. The gathering around the fire in the middle of the stage later on was well-choreographed and definitely added to the fantasy of the scene. the second act was the least captivating at all, beginning with those strange costumes for the chorus, very different from any over designed for that production, and awkwardly irrelevant. the last act however was incredibly powerful. The use of duct tape to build walls across the stage was not only visually brilliant, I also can't think of a better way to symbolize the New Castle March. 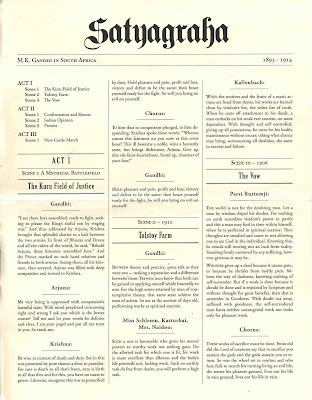 At the end of Act III, the set completely opens up, leaving nothing but a very high and thin podium in the center, where an actor, back toward the audience, plays Martin Luther King and silently harangues an imaginary crowd. Some videos of MLK had previously been projected on the walls before they open. 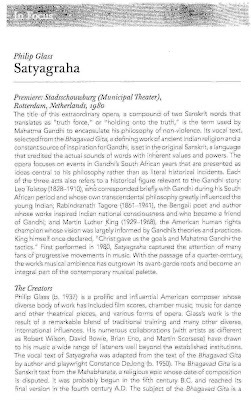 Not only does this reference make sense and perfectly relate to Gandhi (both being non-violent revolutionary leaders), but the timing couldn't be better, as we recently commemorated the 40th anniversary of Martin Luther King's assassination. 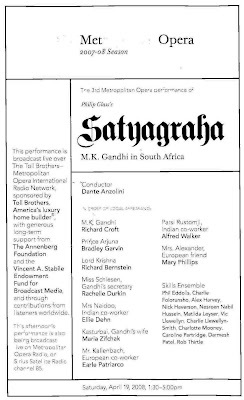 I am pretty sure I wouldn't have survived this Satyagraha experience had it not been for that superb production of Phelim McDermott that premiered last year at the English National Opera and is his first opera direction. 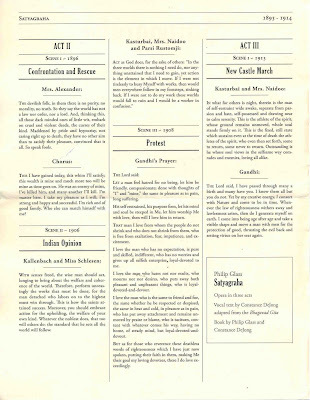 This was indeed a unique and fantastic experience, one of those I will carry with me for many years. 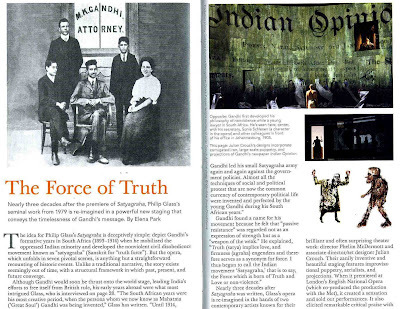 More photographs of the production here.